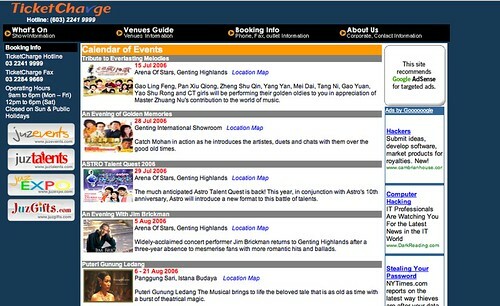 Ticketcharge.com.my, a Malaysian website that sells event tickets online appears to have been hacked. Forgot to take a screenshot of it but this screenshot from google cache taken today can be seen below. This happened over the weekend or perhaps earlier. Google cache here . This will be gone when google re-cache the site again.